Slots into a studio or stage set-up seamlessly and gives very impressive results, especially for the money. Fantasitc Lexicon sounds; easy-to-use; can be controlled via your DAW; and all for only £300. Only 99 user preset slots (although more can be stored on your computer); 48Khz sample rate may be too low for some audiophiles. 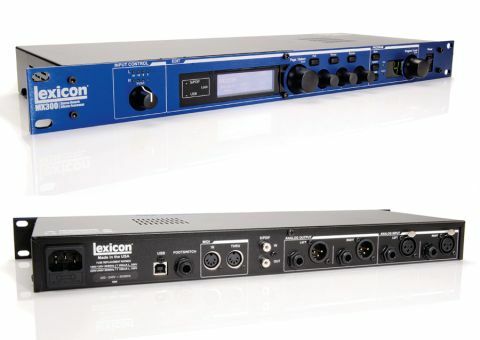 Lexicon's excellent signal-processing units range far and wide in high-end studios and sound-support systems. Of late, the company has been addressing the needs of project-studio developers with the MX200 and MX400 effectors, offering classic reverb sounds (plus other treatments), in a box that can be controlled from a DAW. Whether on Mac or PC, the devices can be automated from within the sequencing environment either by VST or Audio Units protocols. This is a good idea because it means reverb handling (which is typically pretty aggressive with system resources) can be handled by dedicated external hardware - freeing up your processor power for other tasks - whilst still retaining all the benefits of real-time adjustments to your effects settings. This is now another option in the Lexicon range in the shape of the MX300, a 19-inch rackmount multi-effects device packing a good proportion of the MX400's functionality, but retailing at just below £300. Lifting it out of the box, it's clear that Lexicon's reputation for build quality is wholly intact. Solid, metal construction with positive-feeling knobs and buttons inspire confidence, as do the balanced XLR/TRS analogue audio I/Os for hum-negating cable runs. Mains is via a C14 inlet (kettle lead), so there's no wall-wart or trailing adaptor to contend with, and there's a USB port for computer connection. There's also a footswitch jack socket, so performers might want to consider the MX300 a quality ambient insert, and MIDI In/Thru further enhance control possibilities. Surprisingly, digital I/O is via RCA phono S/PDIF - no optical option - so, as you'd expect, this makes for a maximum digital sampling rate of 48kHz at 24- bit, which is quite adequate for most tracking applications. The widest (quoted) frequency response is from 10Hz to 22kHz, so whales and bats beware. What really matters, though, is how the MX300 sounds and how easy it is to use. There are no concerns to report on either criteria. You can run the unit as a stand-alone device, relying on the front panel's well-laid-out buttons and rotaries. The info from the main LCD screen, and its underlying paging system, is simple to grasp and you've multiple parameter knobs with which to edit settings - a whole lot more intuitive than some manufacturers' 'one-knob-and-button-controls-everything' approach. There are 99 presets, with room for another 99 user-devised settings, and creating them is a breeze. From Plate Reverb to Arena, there's an avalanche of ambience to be had, plus distinct delays (a tap-tempo button features), chorus, phase, rotary, vibrato and pitch-shift. The MX300 can even be applied to dynamics processing thanks to DBX compressor and de-esser facilities. The dual-processor design makes for a healthy variety of configurations. Dual-mono is an option for bumping different effects to separate channels, as are Parallel Dual Stereo and Cascade - this latter by which Effect 1 feeds straight into Effect 2 in stereo. The output is positively sparkling. An effects device is often described as 'characterful', in that it adds colour to the sound. Sometimes, though, the better option is 'transparent', and that's what the MX300 does very well. Analogue I/O is quiet and clean in operation (Lexicon quotes Total Harmonic Distortion plus Noise as less than 0.0019%). The reverbs, at which it excels, are rich and flexible and the inclusion of quality modulation effects makes the package particularly desirable. Its three parameter-adjustment knobs make editing from the front panel a breeze, so you may quickly fill up the 99 user memory slots. Here's the clever bit. Reverberation is a demanding application for even the stoutest workstation. While the MX300 operates as a separate unit from a DAW (as opposed to, say, a TC Electronics PowerCore, which functions as a coprocessor), it's possible to add quality reverb to the signal chain through analogue routing and enjoy the benefits of patch-editing via USB. MX-Edit editor/librarian software is bundled, so you can use the workstation to delve into the guts of the machine, as opposed to fiddling with front-panel controls. And it works well. Even a signal-processing novice will soon get a handle on the software front-end, such is the elegance of the on-screen interface, authored for both Mac OS X and PC. Some might quibble about the sample rate, but then even on-set recordists and film-sound studios rarely go beyond 48kHz (DVD soundtracks are exactly that, and it's possible to induce artefacts when downsampling for mastering from a higher sample rate). Others may whinge about the relative scarcity of user memories, but there's more than enough for the project studio or modest PA rig, at which this device is aimed. And while a few people might hanker for true co-processor/DAW functionality, it's important to take into consideration the price tag, the MX300's incredible sounds, and ease of use. de-essing for the vocalist; but the best of all for sound are the glittering and accurate Lexicon reverbs; they're legendary for a reason. Decent-quality, studio-reverb hardware processors with multi-effect capability cost more than a grand not so many years ago. This one's a snip. You could spend a load more on a condenser mic or even a pair of audiophile headphones. Many musicians and producers aim to keep audio processing all in one box - there are plenty of multi-effects plug-ins out there and DAW software tends to tote virtual mixing environments. But if you're the sort to deploy hardware solutions for processing needs, typically work with a hardware mixer and need a simple and effective digital reverb in the rack, then the MX300 is an excellent bet.